Bute Park underwent a £5.6 million restoration project, supported by a £3.1 million grant from the Heritage Lottery Fund (HLF). 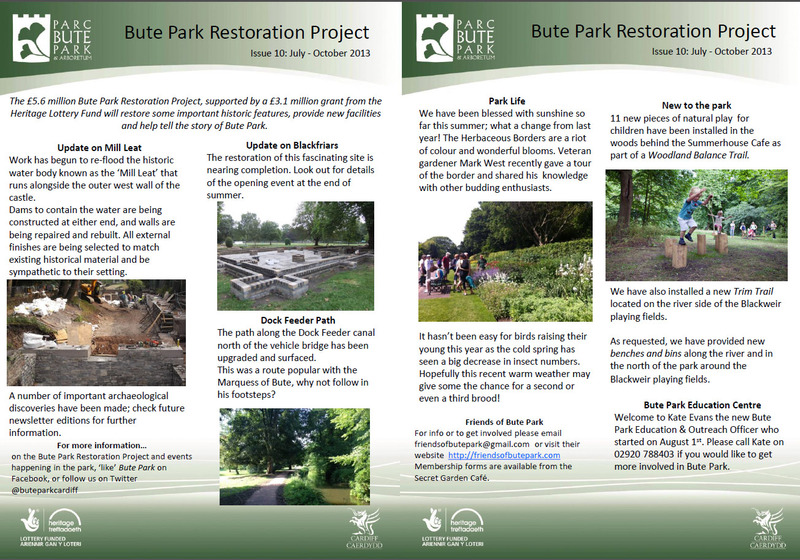 This was to restore some important historic features, provide new facilities and help tell the story of Bute Park. Completed Oct 2010, the iconic William Burges landmark was cleaned and and the damaged animals repaired. The restoration and extension of this historic landmark has now been completed, and will provide a visitor information/orientation point, refreshment and retail facilities, and additional public toilets within the park. As a point of note, the tiles for the tiled floor in the café area are the Victorian tiles from the Friary. They had been taken up by the History Society in the mid 70’s and stored in boxes in the nursery. The Friends were involved with sorting the tiles for use in the café along with some of the people who originally took them up. This new facility discretely located within Bute Park Nursery, plays on the concept of a “secret garden”, and is the hub of the park’s public education programme. The Council’s horticultural staff train here, and it provides additional refreshment via the Secret Garden café and toilet facilities. Signage, seating and interpretation continually improved throughout the park, this with an increased staff presence will make usage more enjoyable for all. Furthermore, nature conservation/biodiversity will be encouraged in the park through improved tree maintenance, replacement and landscape management The Park is maintained by a team of Park Rangers and gardeners. Work being undertaken to conserve and interpret the medieval Friary remains and the late Victorian interpretation of the original building plan. Reintroduction of water to the old castle moat that runs along the original 12th century mill stream restoring beautiful views and enhancing the character of the park to the west of Cardiff Castle. Improved signage and interpretation allows increased awareness and understanding of the park’s nationally significant tree collection.